I was nostalgic today of my preggy days when came across a Hil's Blog. As a first time mom, I was overwhelmed with the feeling of "first time everything", even until now. Pregnant with Thames, there was one of the many things I remember that never fails to put a smile on my face on a weekly basis..a newsletter from Pregnancy Weekly. Aside from the details on what you need to expect, they include a similar cartoon picture like the one I posted above. And thinking about it now, it helped my get through it all. In life whatever challenges you are faced with, I believe that any simple funny situation that can make you smile or even laugh will work wonders for you as it did with mine. I'm an avid fan of the book Sneaky Chef because of my son who's a picky eater. But prior to the wonderful book discovery I was already a "Sneaky Chef" by heart, I guess any mom who has a son like mine would become one. I've experimented with carrots and broccoli in pancakes just so he could have a healthy breakfast. And then I moved to cupcakes/muffins since they became his favorite, I make it enticing as well by buying colorful liners. Making these healthy breakfast/snack item also prevents me from throwing common fruit favorites when they're close to being over-ripe. Honestly, even for a fruit lover like me I still get tired of eating the same thing for a week and my hubby is not a fruit person at all. Since I have tried making these baked goodies they are always a hit with the boys. Now, no fruit goes to waste in my kitchen - almost. I also discovered a good recipe from Sunny Anderson a couple of months back, you can even add your desired healthy ingredients. I'm not a big fan of blueberries ( I like to eat them fresh) in a baked recipe so I omitted it from the original list of ingredients. In the picture shown, I used strawberries, zucchini,carrots, bananas and walnuts. And I'm calling it my "almost-everything-in-it" muffins. Its moist,filling and I must say the healthiest I've made so far. These muffins will still taste better even after days in your fridge. So for people on the go, you can just pop it in the microwave oven and viola! you can have something wholesome and enjoy it without getting your hands messy.I think muffins also are good when your watching your weight since you have portion control. 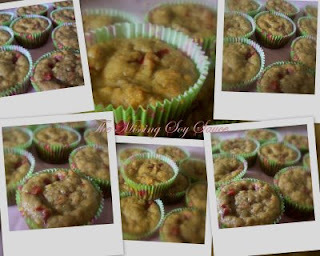 Making these cupcakes/muffins is the most effective way to encourage my child eating his fruits and veggies even at breakfast without the fuss. 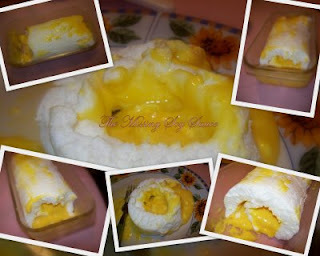 Its probably ages since I last made Brazo de Mercedes. The recipe came from my home economics class in high school. My mom was ever so proud that I decided to make it for her birthday when I was yet in college. 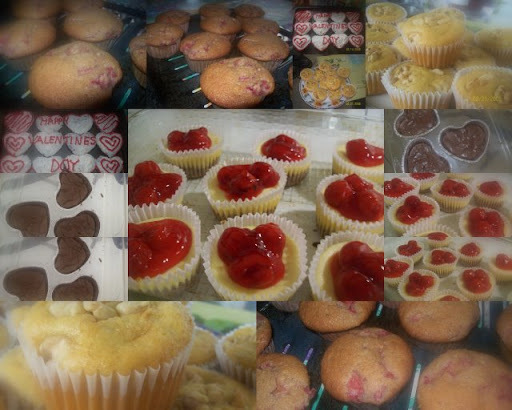 Yesterday, I decided to make the dessert again. Thammee and I celebrated our 3rd year, I made his favorite crispy pata and he bought champagne for us to enjoy. But on the 23rd I did not make any dessert to go with our special homemade dinner because I was not very confident that I would be able to make it on time. And besides serving an 8lb. chunk of meat, I knew that there will be no more room for dessert. I told him that we will just have our sweet treat anytime this week. I made instant pasta - (my definition of cooked pasta with bottled sauce) for dinner, and it can be done in less than 30mins. including the cooking time of the frozen garlic bread. I needed something challenging so I whipped up the Brazo. The recipe was sitting in my "UNTESTED" recipe folder for more than a year now, but its not the same old recipe from home economics class anymore. The results did not exceed my expectations - presentation wise but the taste was really exquisite. Thammee's reviews agreed with mine. And now the recipe can finally move to my "tried and tested" folder. Ever since I became a mom, my trip to the theaters to watch movies on the big screen lessened. But I still watch movies at home most of the time. My hubby is a movie buff so I'm always updated with what is playing currently. One of the wonderful perks my family have enjoyed here in the US is being able to watch movies for FREE. Yes, because their public library provides these resources. They have DVD copies of movies that's available to the public. My hubby enjoys this privilege as much as I do. And with today's economy its the most PRACTICAL form of entertainment especially for people like us who loves watching movies. Most of the movies I watch are new on DVD. But recently I started borrowing old movies, these are some of the movies I enjoyed so much back in college. One of my favorite genres is Romantic Comedy. And lately I have watched Sabrina and The Bachelor as if it was my first time. 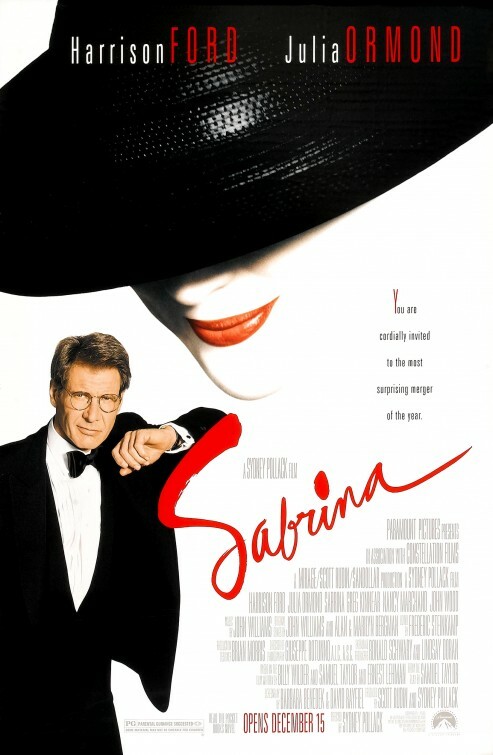 These movies made me hark back to my early days when I was single and enthusiastically awaiting for "the One". But one of things immediately came to mind was the my previous wondering "When would be that day come when I would fall in love as if nothing else mattered?". Thinking about that now, it makes me feel satisfied knowing that I was certain of the things my heart desired. But I just feel bountied knowing I got what I wanted. Its not hard to figure out why people like me are into Love Stories. We want to have the same love story that we saw or we can just simply relate to it. And here is a collection of quotes that moved me in the most exceptional way. Once upon a time, on the north shore of Long Island, not far from New York, there was a very, very large mansion, almost a castle. And on this very large estate lived a small girl. And life was pleasant there and very, very simple. But, then one day, the girl grew up and went beyond the walls of the grounds and found the world. and still sees what you think you look like. everything that happens is accidental. asking him to love her. and that's what I hope to give to you forever. On our recent trip to San Fransisco, we stayed at the Hyatt near the Fisherman's Wharf. The trip was one of the most unforgettable experiences I will ever have in my life. But aside from the key chain that Thammee gave me, I kept the tube of Portico Spa lotion that our hotel rationed us. The scent was just so incredible that I decided to take it with me. It reminded me of a Jessica McClintock perfume, which is a favorite of my Aunt. Just this week I asked Thammee to buy it for me online. He was reluctant to agree to my wish since he found the scent unsuitable for me. But I reminded him of the night he complemented how fragrant my hands were, then he agreed. "One of these days!" I giggled with delight. Portico Spa is exclusively sold online - http://www.porticospa.com/ . I just love thier White Ginger scent. I am hoping to try thier other products. But thier body lotion is definitely on my wish list. I was just reunited with a college friend thru the worldwide web. Ahhh.. the power of technology. Since I am online most of the time, we always have short chats every week. On our latest chat, she mentioned that she was making brownies from scratch for a bake sale. And in that instant I was nostalgic of the scent of freshly baked brownies from my oven. That thought alone lead to another baking session in my kitchen. I once remember a stall in SM who sold brownies that were so divine that each time I go there I always buy from them. I cant remember the name anymore but all I can say is that thier brownies were the best I've ever tasted. Who can resist brownies anyway, especially when its a healthier version? Yes, I make my brownies healthier. I use healthier ingredients like purple puree - mixture of blueberries and spinach, whole wheat and wheat germ. I didnt believe it at first that it would make a very delectable brownie but you have to make it to believe. I got the recipe from The Sneaky Chef Book. But this time I made it sinful by making it "Rocky Road" style, just added marshamallow, nuts and extra choco chips and viola! It definitely took care of my craving. Since I got here in the US, I never failed to have a craving for fish. You rarely can get it fresh in this part of the East Coast. And as far as I can remember fish was always fresh from where I came from. The variety of seafood are so many that each time I think of it I often ask myself when the day would come I can enjoy it again. But anyway, its now lent so I make sure that we observe the No-Meat Fridays. And having little options I decided to make my mom's fish ball recipe. I did not exactly follow what she told me to do but somehow I think it didn't turn out bad. Tilapia was my only choice of fish since the taste is already familiar and its the only practical kind I can get here. When I was making this I remembered a poached fish recipe. Curious enough I looked it up in the dictionary what poached meant, its "to cook in a boiling or simmering liquid". Another cooking term discovered, and another way of making food sound fancy. My hope now just like always after every food experiment I have is that Thammee will enjoy it. (its his lunch for today). As for the rest of the fish ball, its frozen for my future recipe - meatless pancit. "Make a back-up"... this is one I learned the hard way when I realized that my freebie account was just recently deleted. My email linked to a Friendster account and 2 websites ( which contained my new mommy & baby journals of my son) was totally gone forever and cannot be retrieved in any means. I was always aware of the fact that it will not be mine forever but I was always procrastinating on finding time to make a back-up. For a sentimental person like me it is hard to accept that I lost all those journal entries of my 2 websites. Eventhough it was not updated most of the time, those entries were written memories that I treasured so much. When my sister asked me, " so you lost the pictures, no back-ups"? I felt stupid for letting this happened to me. Yes, the pictures are there but no entries and that simply makes me sad. But then life goes on, and you learn your lesson. Now I am officially back, back from my supposedly-one-and-only blog/website since I arrived here in the US. I guess this the first official entry to my "Life Lessons to ME" label. Lesson #1 Make Back Up - for everything!